I’m writing this entry from the Chase Visa VIP Lounge which is located at the Institute of Directors club at 116 Pall Mall, an easy walk from Trafalgar Square and the Charing Cross station. Your Visa Card issued by Chase is your ticket to the VIP Lounge during the London 2012 Olympic Games. Enjoy complimentary amenities and unique experiences every day at this private club-like retreat during your trip to the Olympic Games. The club allows any Chase Visa card member to enter with up to 5 guests from 10am – midnight every day until the closing ceremonies. I arrived on Sunday and have been at the VIP Lounge almost every day, the amenities are fantastic. There is very good complimentary food throughout the day including breakfast, lunch, and dinner and an open bar with beer and wine from 11am onwards. Soft drinks, coffee, water, and snacks are also provided throughout the day. Beer selections are Heineken, Amstel, and 1664. There’s wifi throughout the lounge and large flat screens projecting the games. The main level was very busy the first few days and they opened up another room upstairs when there was no longer sufficient seating. 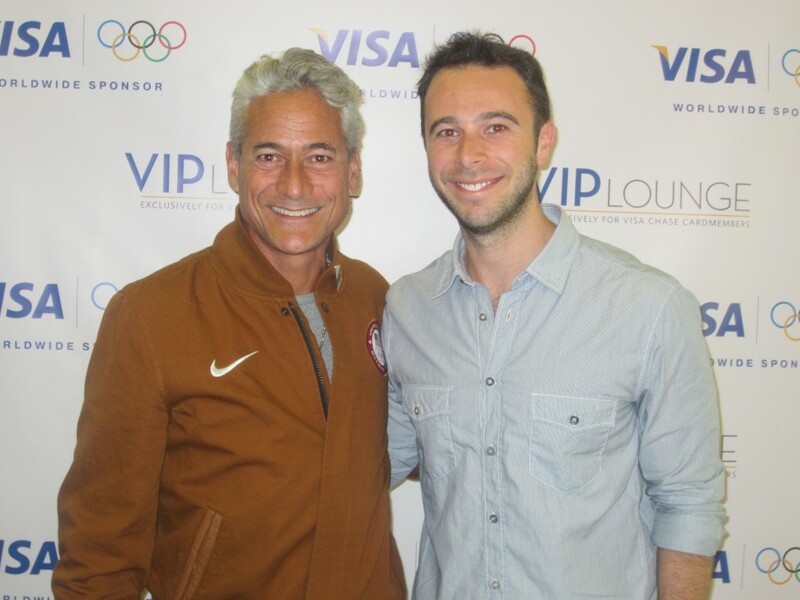 As a Visa Chase Cardmember you have the unique opportunity to meet Olympic Athletes at the VIP Lounge every day from 2-4PM. These sports heroes will be available to sign autographs, pose for pictures and share their most memorable stories. I did RSVP to the majority of these events but Chase has been extremely generous and essentially anyone who arrives by 2pm is allowed to participate in the meet and greets. Each athlete speaks for about 45 minutes including a Q&A and then takes pictures with the audience. The athletes were open to answering just about any question which made for much more interesting sessions. I met Nadia Comaneci & Bart Conner (very interesting Bart did all the speaking and greeting and Nadia sort of just smiled hah, anyone else attend this one? ), Greg Louganis, and will try to get to the Carl Lewis event tomorrow. Throughout the Olympic Games, Visa Chase Cardmembers are invited to taste from a selection of Chef Morimoto’s creations at the VIP Lounge. Celebrity Chef Masaharu Morimoto joins the VIP Lounge in London to bring a series of unique culinary experiences during the Olympic Games. Feast on small bites from around the world — from his mouthwatering sushi and other popular Asian dishes to some personal favorites, including his take on classic American and British cuisine. The dishes vary by night but generally include: Rock Shrimp Tempura; Crispy Lamb Chops; Spicy King Crab; Hamachi Tacos/Tuna Pizza; Vegetable Tempura; Crab Wonton Soup; Angry Chicken Wings; Shu Mai and Gyoza Dumplings; Beef Carpaccio; Corn dogs; Sticky Beef Ribs; Wagyu Sliders; Braised Black Cod; Ribeye Carving Station; Morimoto Mac & Cheese; Duck Fried Rice and Soba Noodles. There’s also a raw bar of oysters, mussels, clams, shrimp, and scallops on weekends. I’ve only gone once for the Morimoto dinner but the cooked food was excellent and the sushi was decent. My favorite dishes were the sticky beef ribs, braised black cod, mac & cheese, and the wagyu sliders. This is one of the coolest free amenities and I met several families who had dinner here every night throughout their stays. I also met several locals who had heard about the lounge from friends and were stopping by on their way home from the office. Chase sticks to the reservations for the Morimoto dinner between 6-9 but generally allows anyone in without a reservation from 9 – 10 as long as you have a Chase Visa. One of the coolest things about the Olympics is just how friendly everyone is in general. Last night at the Chase VIP Lounge I met Christina who lives in London but is originally from New York. After the Morimoto dinner we decided to head over to the Brazil Olympic House where we ran into Frances from New Zealand and Tom from the UK. The house was closing early which led us to meet Evelyn at the exit gate, a Californian who is now living in London. We all decided to take a taxi over to the Danish House together where we met a few additional new friends. Ultimately we all ended up heading to a bar in SOHO for the rest of the night, a random but extremely fun night! Getting into the VIP France House (Club France) and the full service dinner that easily outshines the Morimoto experience as well as the after hours party. A tour of the private USA House, yes I was able to convince the USOC staff that BoardingArea qualifies for media credentials. A summary of my favorite events, the venues, Olympic Park, food offerings, and transport to and from the games. How’d You Get Tickets to the Olympics? Thanks for the review. Heading out there today from LAX. Finally scored tickets to the women’s volleyball match tomorrow night against Brazil. Can’t wait! @DP81 – Nice, tough loss though. I’m sure you still had a great time! Thanks for the insight! I will be going to brazil for this year’s olympics. I would hope they have something like this for this year’s events! As a chase card holder, I hope to get a more personal experience. So excited for the games!